Some members of the Hampton Safari Club are also volunteer crew for the Waveney Stardust Trust Ltd. 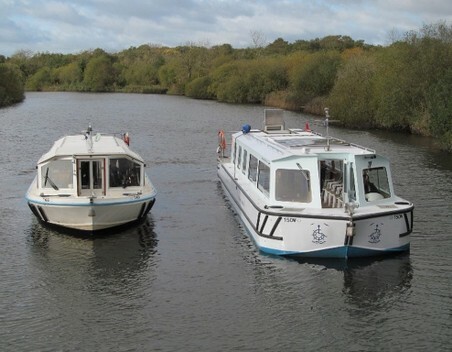 Founded in 1988, and now in it's 23rd cruising season, the Waveney Stardust Trust is a registered Charity, certified by The Broads Authority, that enables disabled & elderly people to have the opportunity to experience the Northern & Southern Broads. 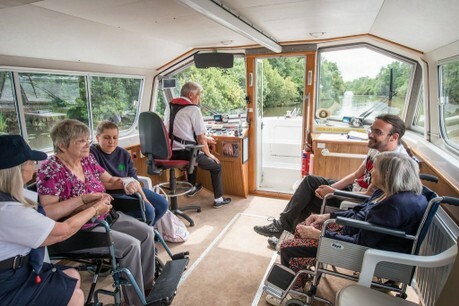 The Waveney Stardust's mission is to provide safe, subsidised, and enjoyable river cruises for the disabled and/or elderly, including their family and friends, who would not otherwise be able to access the pleasures of the Broadland Waterways. The Trust has two boats operating from Stalham & Horning on the Northern side and Beccles & Brundle on the Southern Side. 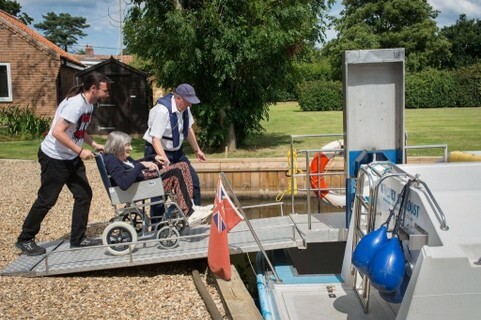 Both boats are specially equipped with easily accessible Ramps & Lifts that can take Mobility wheelchairs. We cater for all aspects of physical & mentally incapacitated persons, including those with Downs Syndrome & Dementia. Although established on the Southern Broads, the aim of the Trust is now to get established more now on the Northern Broads. As well as offering pleasant and comfortable cruising opportunities to non boating enthusiasts, Waveney Stardust also offers an opportunity for ex-hirers or ex-owners who have had to give up their normal boating activities due to age, infirmity, disability or ill health to get out and about on the broads and revisit favourite locations. As a disabled person myself, with an artificial leg, I am passionate about promoting the beauty of the Broads to all disabled individuals who otherwise would not be able to access or enjoy them, at a low subsidised cost. If you know of any disabled/elderly persons who would enjoy & greatly benefit from a trip, especially on the Northern Broads, bookings can be taken on 07817 920502 or visit our website on www.waveneystardust.co.uk. Article written and supplied by Alan McKechnie, Director Boat 1, Waveney Stardust Trust.